C14 Time is a curious creature in the consensus calibration curve that has a nasty habit of flipping into reverse. Taking a closer look at these C14 Time excursions it becomes apparent they are generally associated with spikes in the level of atmospheric Carbon-14. Note: Click images to view at higher resolution. 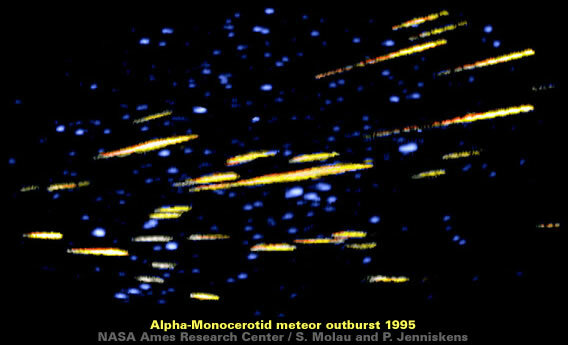 A possible cause of spikes in the Carbon-14 record are incoming cometary debris trains. Atmospheric nuclear testing in 1962/3 created a spike in atmospheric C14 that gradually decayed. This well documented example of the atmospheric C14 decay curve provides a good indication of how the Earth’s atmosphere would respond to a cometary debris train. Therefore, its possible that the Wikipedia C14 decay curve for Vermuntsee [purple trace – below] can be used as a visual template to help identify the Carbon-14 signature of any inbound cometary debris trains recorded in a Carbon-14 chronology. ► There are many potential matches over a surprisingly large range of time scales. ► Many of these matches are rotated by 20 or 30 degrees. ► One of the matches appears to have been flipped horizontally. A closer inspection of the Carbon-14 spikes embedded within the Irish Oaks Chronology strongly suggests there is a problem with the radiocarbon measurement methodology when it encounters a sudden spike in Carbon-14 values. These spikes in Carbon-14 introduce curved artefacts into the chronology as the increased levels of Carbon-14 are progressively deemed to represent younger elements. However, radiocarbon dating could become totally self-reliant by dumping dubious dendrochronological calibration and adopting a self-calibrating technique based upon the Δ14C values in the chronology. Given the heritage of the consensus calibration curve it’s really no surprise that the visual template finds very similar inherited artefacts in this Carbon-14 chronology. The really intriguing aspect of the consensus calibration curve is how the radiocarbon calibration process typically transforms these Carbon-14 spikes into symmetrical, straight line rises and falls i.e. like isosceles triangles. Clearly, calibration doesn’t try to emulate the observed Carbon-14 decay curve. This is especially true for the remarkably straight [and precipitous] calibrated decay in Carbon-14 between 1900 and 1950 CE which is achieved by another truly breathtaking piece of Anthropogenic C14 Time Travel. Overall, between 2050 BC and 1950 AD, the consensus calibration curve is a remarkable [and long standing] feat of engineering that combines several goal seeking objectives that are amorphously arbitrated within academia. Gallery | This entry was posted in Arabian Horizon, Catastrophism, Dendrochronology, Deranged Dating, Heinsohn Horizon, History, Radiocarbon Dating. Bookmark the permalink.